Fruitless Pursuits: Lego Minifigures Series 7 Is Out! Photos & Bar Code / Bump Code Decoder! 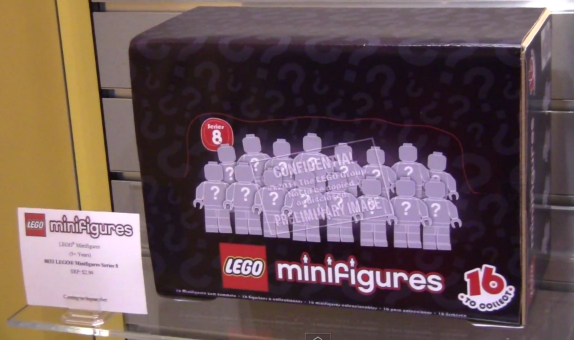 Lego Minifigures Series 7 Is Out! Photos & Bar Code / Bump Code Decoder! The newest series of Lego Minifigures (Series 7!) is out in stores and waiting for you to feel around the bags to find your favorites. I was able to pick up 6 yesterday, so I have some photos to share. I also scoured the net and found a bump code detector, so you can save some time (and also save money from accidental duplicates) while shopping. Click through the jump for images of the minifigures and the bump code detector! I managed to get 3 out of 6 with my biggest Lego pet peeve... cloth. The Bride and Daredevil both have capes, and worst of all, the amazing Bagpiper has one of those terrible cloth skirts. They kind of work, but I prefer my plastic to be all plastic. There were a few others that I really wanted, but I was in a rush and could only quickly feel them out. I would have passed on the Bride, but I kept it because I knew it wasn't a double. I absolutely love the Ocean King and the Bunny Suit Guy. I can't wait to get the Galaxy Patroller (I call him the Halo dude), and the hippie. And for those with much better eyesight than me.... THE BUMP CODE DETECTOR! From Wisdom Begins In Wonder, a site that showcases the minifigures in great detail. And finally, Series 8 is coming in September. There is no real information out there, but I found this list at a blog called Jensen's World. Wishlist or insider information? It doesn't seem too far off and seems to complete some existing sets, but I don't think there's any surprise in this list. I've been surprised so far with each series. And #5 Monkey Suit Guy is a duplicate of an earlier series. Who knows. DOES IT WORK???? I've had too many double-ups before this method, should I risk it? I usually combine both methods when possible. The bumps are very hard to see. They are dots on the bottom of each bag, you can only see them from the front and is really hard. Wow, I never even realized that. I thought it was supposed to represent a long wedding dress, and at the time I thought it was a stretch. Now it makes total sense.